APRIL 2, 2012 -- You may be surprised to learn that the tiny exfoliating "beads" found in products like facial cleansers, toothpaste, and hand cleansers often are actually made of plastic. These bits of polyethylene plastic are too small to be caught by wastewater treatment plants after they wash down the drain and instead end up in the ocean, where they may become a hazard to marine life. A 2009 study at the University of Auckland in New Zealand revealed that the average person is now likely to use cleansing products with microplastics on a daily basis because the majority of facial cleansers now contain polyethylene microplastics. But what does all this plastic mean for the environment? "While we don't yet understand the impacts of microplastics to aquatic organisms," says Dr. Joel Baker, professor at the University of Washington and Science Director of the Center for Urban Waters in Tacoma, "we do know that releasing persistent materials into the ocean will result in ever increasing concentrations of marine debris." While this issue of microplastics in the ocean was first addressed by scientists in the 1970s, interest in it has grown substantially in the last decade. According to the 2010 proceedings of an international workshop on microplastics [PDF], it is now internationally recognized that marine organisms do ingest these tiny plastic particles, with the potential for harm from, for example, the toxicity of chemicals in the plastic. 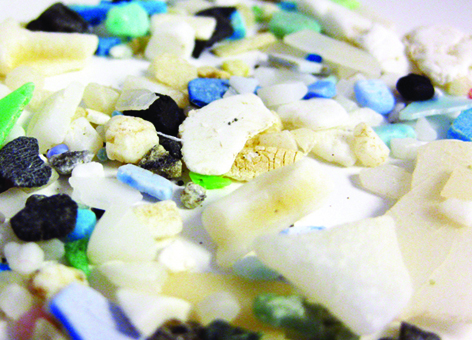 The NOAA Marine Debris Program is leading efforts within NOAA on the emerging issue of microplastics, which they define as plastic pieces approximately the size of a pencil eraser or smaller. They are working in partnership with the lab of Dr. Baker at the University of Washington Tacoma to standardized methods for collecting samples of microplastics from sediment, sand, and surface water. This project, funded through the Joint Institute for the Study of the Atmosphere and Ocean, determined a relatively simple, cost-effective, and unbiased laboratory method to estimate the quantity of three plastics (polyethylene, polypropylene, and polyvinylchloride) in environmental samples. The goal is to determine concentrations of these plastics in the environment—to figure out the extent of the problem—and the study has found microplastics on virtually every beach surveyed. Dr. Baker's lab has developed methods to measure microplastic particles larger than about 0.3 millimeters (less than 1/80 of an inch), the size of the nets used to collect the samples. Most of the microplastics in consumer products are smaller than this. To date, no one has detected the consumer product plastic beads in the environment. According to Dr. Baker, "They are almost certainly out there; we just don't have the tools to detect them." A huge challenge to addressing this type of marine debris is that original sources of the microplastics are extremely difficult to trace. The next step in this study is to assess the potential chemical impacts of microplastics. You can find more detailed information from the Second International Research Workshop: Microplastic Marine Debris. Courtney Arthur, research coordinator with the NOAA Marine Debris Program, expects research on microplastics and the effects on marine life to be a hot topic among scientists over the next few years. But for now, she says, the bottom line is still unclear. "We know it's possible they could be accumulating in the food chain," says Arthur. "The entire spectrum of marine life, from lugworms and mussels to fish and marine mammals, has the potential to take in these small particles. But at this point, it's hard to say if these particles are bioaccumulating in food webs and how much harm is being caused by chemicals in the plastic."